The 2012 $50 American Buffalo Gold Bullion Coin was issued by the United States Mint as the seventh annual release in the series. The program debuted in 2006 and features coins struck from .9999 fine 24-karat gold. In comparison, the American Eagle Gold Bullion Coins are only composed of 22-karat gold. The Buffalo series was the first time the US Mint released bullion coins from such a fine grade of the precious metal (proof versions of the release are also issued by the US Mint). These coins are sought after not only for their precious metal content, but also because collectors are drawn to the designs of the coin. Both the obverse and reverse imagery was taken from the 1913 circulating nickel which earned the nickname of "Indian Head Nickel" or "Buffalo Nickel." They were originally created by artist James Earle Fraser. The Mint also produces a proof version of this coin for collectors. 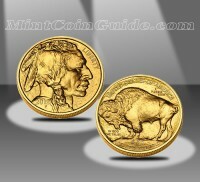 Buffalo Bullion Coins are not sold directly to investors and/or collectors. Instead, they are sold to authorized purchasers who resell the coins to the public for a small premium above the current spot price of the gold contained within them. Authorized purchasers were initially able to order the bullion coins from the US Mint on March 5, 2012. Bullion Buffalo Coins are sold by authorized purchasers for a small premium above the current spot price of the gold contained within them. Buffalos are struck at the US Mint’s facility in West Point. Both the obverse and reverse imagery of the bullion Buffalo Coins were originally featured on the 1913 circulating nickel as designed by James Earle Fraser. The obverse shows the portrait of a Native American with the reverse depicting an American Bison (also known as a buffalo).